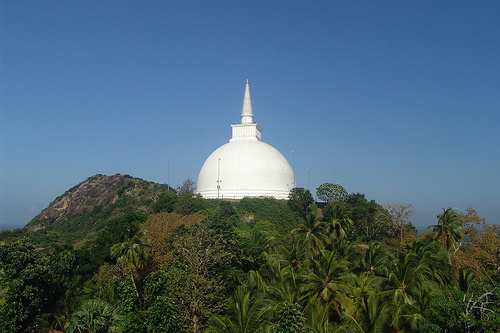 Mihintale: where Buddhism was introduced in Sri Lanka. A special place during Poson poya. Today is a full moon day (poya) and in the Sinhala Buddhist calendar it celebrates the arrival of Buddhism in Sri Lanka in the 3rd century BC. It is a festival of great historical and religious significance and is celebrated island-wide, second only to Vesak. I like poya days for many reasons, written about here. So, as I often do on a poya day when less busy than usually, I ponder on things. It’s my form of meditation and for some reason a full moon helps. Feel free to call me as mad as a hatter but there are many that agree that a full moon has a special significance. There is even a wiki page on this phenomenon ‘Lunar effect‘. Far from going a bit nuts, though, I feel calmer. I find it is a time to put the things of the month gone by in perspective and Poson is particularly relevant to what is to me just a very personal thing: “On the day, pilgrims gather at Buddhist temples across the country to Observe Sil (“Atamasthanaya”) – A practice where followers wear the most simplest of white clothes, and take time out for a period of reflection, on both the self, and on the teachings of the Buddha. This period of self reflection is said to bring one closer to detaching from worldly pleasures and coming closer to attaining Nirvana. Devotees also gather to listen and understand the teachings of the Buddha or “Dhamma”, through sermons and preachings by senior Buddhist monks.” (taken from amazingasia.com). I did none of this but the mention of self reflection hit a nerve. So, it is not all mysticism and talk of werewolves? The moon has an effect on tides, that’s pretty big is it not? So, why should it not affect our moods? Food for thought if ever there was any. It is a lovely peaceful day. The girls and women in the village dressed in white walking to the temple and whole families enjoying themselves on the beach with picnics. Along the Galle Road other families are crammed into pick-up trucks or singing on a rented bus. Distant chanting of monks from the village temple ebbs and flows with the wind in my breadfruit tree. Yet, something is bugging me today. It is the light. Something about the light, something about the weather. And it’s not the moon bathing the garden in ethereal light these last few nights, it’s different. It is no secret that India is in the midst of a pre-monsoon heatwave. 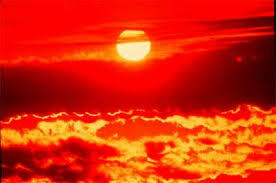 The Times of India has proclaimed it the world’s 5th deadliest heatwave ever. That is quite scary in general. All the more so here because Sri Lanka is not a million miles away. I have been hot, my fan is on higher, colder and I am complaining more. It’s humid, sticky and hot. Uncomfortable. So yes it is very hot, we have established that, but I have noticed the light is off, it’s different. I have been observing this for a while but it was especially noticeable after having left the country for 6 days a fortnight ago. Now, when we have the cross-over from season to off-season this happens, but this year it is extreme. In Hikkaduwa where I live the sunset has moved quite considerably in position. Sadly I do not have good photos to compare but let’s just say it no longer sets where it usually does (or should do at this time of year, however, given our proximity to the equator it should not deviate much at all). The strength of the sun has also increased as I can testify by getting sunburnt in half the time I would have done in December, just a few days ago. The sun shines when it doesn’t, it buckets down when it shouldn’t (or when you are least expecting it to). The BBC weather centre tells me the rains are coming, yet it told me this last week and we are still waiting, sweating. It’s different. On this Poson day, this leads me to consider global warming, then suddenly remembering how the light was off in the weeks following the 2004 Indian Ocean tsunami when the weather turned weird and different. I was here then too, suddenly the memory is razor sharp and I remember nuances, which I had pushed to the back of my head. Could it be Nepal, the earth’s axis adjusting once again? Shivers suddenly rush down my spine in this heat, and humidity. The earth changes, as do the seasons, the sun and moon are in a constant state of flux. The only constant thing is change. I had a flutter of panic in my chest until I realised that. The only constant thing is change. Now I watch the moon and am at peace once again.